At the 6th European Grid Conference we looked at three different dimensions of the power grid: society, economy and the environment. How can grid investments have a social dimension? How can economic benefits for communities affected by new grid infrastructure be realised? How can biodiversity and nature profit from new and existing power lines? We discussed whether grid investments with social return would work. And how a direct social return increases public acceptance for grid projects. You can download the event summary here. Joseph Kennedy II, Chairman and President Citizen Energy Corporation The founder of Citizens Energy Corporation, Joseph P. Kennedy II has served as Chairman and President of the company since 1998 following 12 years of service representing the 8th Congressional District of Massachusetts in the U.S. House of Representatives. Kennedy founded the non-profit company in 1979 to provide low-cost heating oil to the poor and elderly. Under his leadership, Citizens grew to encompass seven separate companies, including the largest energy conservation firm in the U.S. During his tenure, Citizens became one of the nation’s first energy firms to move large volumes of natural gas to over 30 states. As a precursor to market changes under electricity deregulation in the late 1990s, Citizens was a pioneer in moving and marketing electrical power over the grid. More recently, Citizens has expanded its oil heat program to serve customers in 23 states and the District of Columbia, launched innovative health care initiatives to make prescription drugs and medical care more affordable, and pursued renewable energy projects involving wind and solar generation. In addition, Kennedy started a pioneering company that develops high-voltage transmission lines and uses revenues from the ventures to provide renewable energy systems to the poor. Each commercial venture is aimed at generating revenues that in turn would be used to assist the poor and those in need in the United States and abroad. Maroš Šefčovič, Vice President of the European Commission Maroš Šefčovič is a Slovak career diplomat and since 1 November 2014 Vice President of the European Commission in charge of the Energy Union. In this capacity, he leads the „Energy Union“ Project Team within the Commission which comprises of 14 commissioners. From 2010 – 2014 he was Vice President of the European Commission in charge of Inter-Institutional Relations and Administration. In 2009-2010, he was European Commissioner for Education, Training, Culture and Youth. From 2004 -2009, he was the Permanent Representative of the Slovak Republic to the European Union. As diplomat by profession he served between 1992 and 2004 in Zimbabwe and Canada and as Ambassador to Israel. He graduated from the University of Economy in Bratislava and the Moscow State Institute for Foreign Relations. He holds a degree as Doctor of Law and a PhD of European Law from the Comenius University, Faculty of Law, Bratislava. He also studied at Stanford University, USA. Antonella Battaglini, CEO of Renewables Grid Initiative Antonella Battaglini is founder and Executive Director of the Renewables Grid Initiative, a forum for transmission system operators and environmental NGOs. In addition to the RGI activities, she is a senior scientist at the Potsdam Institute for Climate Impact Research (PIK) where she leads the SuperSmart Grid (SSG) process, a concept she developed together with her team to reconcile different approaches to renewables. By adopting a holistic approach, the SSG addresses the challenges of the transformation of the power sector considering generation, transmission and demand management. In this concept both centralized and decentralized generation play an undisputed role. Ms. Battaglini holds an MBA from the Berlin School of Economics. Paul-Georg Garmer, Head of Public Affairs, TenneT Paul-Georg Garmer works as Head of Public Affairs at TenneT TSO GmbH since April 2013. Mr. Garmer joined TenneT after he held the position of the deputy lead of the business section for energy and environmental policy at the German Association of Energy and Water Industries (BDEW) after it was founded in 2007. Prior he worked as head of energy politics and regulation at the “Bundesverband der deutschen Gas- und Wasserwirtschaft” (BGW), the predecessor institution of the BDEW since 2003. Previously he worked as the office manager for the German Member of Parliament Peter Weiß (CDU) in Bonn and Berlin. Mr. Garmer holds a degree in political science, anglistics and history from the universities of Münster and Freiburg. He is politically and voluntarily involved as member of a regional parliament, the lead of his party faction as well as member of the supervisory body of Caritas-Krankenhilfe Berlin e.V., funding organization of three hospitals in Berlin and Brandenburg. Gerald Kaendler, Vice President Asset Management, Amprion Gerald Kaendler is Vice President Asset Management at Amprion since 2009. Amprion is an independent privately owned Transmission System Operator (TSO) in Germany, its grid supplying 29 million customers in the industrial heartland of Germany and being connected to 5 countries. Gerald held the same position at RWE TSO (Predecessor Company) between 2003 and 2009. Prior to this, he worked as Senior Manager Strategic Asset Planning at RWE Net, responsible for the Asset Strategy from the low voltage system up to the extra high voltage grid. Before 2000 Gerald worked at RWE Energie as an engineer for high voltage and extra high voltage grid planning. Marco Nix, CFO 50Hertz Marco Nix is responsible for 50Hertz’s Finance Department since July 2015. Before that, he was Head of Controlling at 50Hertz. Moreover, he became Chief Corporate and Financial Officer of Elia Grid International in April 2014. Born in Berlin (1974), Nix previously held senior positions in the financial department of the Vattenfall Group. His professional career in the energy sector began in 2001 at the Berlin-based energy company Bewag. He studied Business Administration. Dominique Ristori, Director General for Energy Dominique Ristori has worked in the European Commission since 1978 and has held several senior positions. Prior to his current posting, he was Director-General of the Joint Research Centre (JRC) from 2010 to 2013. Between 2006 and 2010 Mr Ristori was Deputy Director General of DG Energy and Transport. From 2000 to 2006, as Director in charge of General Affairs and Resources in DG Energy and Transport, he was responsible for interinstitutional relations; enlargement and international relations; coordination of energy and transport research; internal market, state aids, infringements and public service obligations; passengers‘ and users‘ rights, as well as central management of human and budgetary resources. 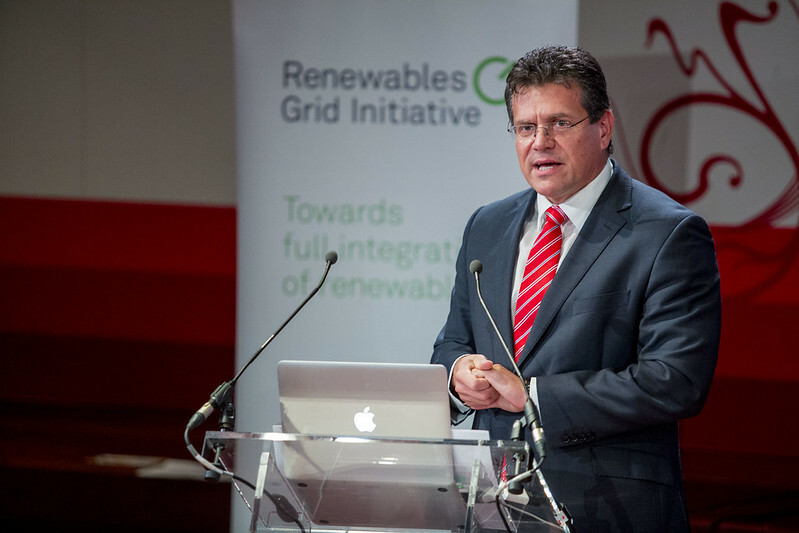 Between 1996 and 1999, he was Director in charge of European Energy Policy in DG XVII (Energy). Mr Ristori played an important role in the preparation and adoption process of the two first Directives on the Internal Market for gas and electricity. He also successfully launched the Florence and Madrid Fora for electricity and gas at the start of the regulatory process in the energy sector. In the period from 1990 to 1996 Mr Ristori was in charge of transnational cooperation between SMEs in DG III (Enterprise). Dominique Ristori graduated from the Institute of Political Studies of Paris in 1975. Rosemary Steen, Director, External Affairs, EirGrid Rosemary Steen was appointed Director of External Affairs in July 2015 having previously held the position of Director of Public Affairs since joining EirGrid in 2014. Rosemary has extensive Corporate Affairs, Government Relations and Corporate Social Responsibility experience from the Telecommunications, Utilities and Business Industry Body sectors. She has previously held senior positions in Vodafone, Shell and IBEC. Rosemary has a BA in Economics and Philosophy from Trinity College Dublin, an MBS in Logistics and Manufacturing from University College Dublin and a Postgraduate Diploma in Legal Studies from Dublin Institute of Technology. Ilse Tant, Chief Public Acceptance, Elia Ilse Tant, member of Elia’s executive team (currently responsible for HR & Internal Communications) is taking up a new role as Chief Public Acceptance. This new division has been integrated into Elia’s general management following a recent internal strategic analysis, to pursue a more proactive policy on stakeholder management and the public acceptance of infrastructure projects. Ilse began her career in 1997, as a lawyer at Stibbe, a Benelux practice specialising in international trade law. In 2002, she joined Elia as Senior Legal Advisor. She then went on to serve as Senior Regulatory Business Analyst (2007-2009), before being appointed a Senior Manager responsible for Permits, Environment and Property (2009-2013) where she managed several large infrastructure projects. In January 2014 Ilse Tant was appointed Chief Corporate Officer, responsible for several corporate departments. Ilse Tant recently completed the INSEAD training course ‚Transition to General Management‘. Prior to that, she completed a middle management training programme at the Vlerick Business School and obtained a master’s degree in law from the Catholic University of Leuven (KUL) and Northwestern University (Chicago, USA) on top of her degree in philosophy (KUL). Edoardo Zanchini leads the energy, transport and urban planning national office for the Italian environmental NGO Legambiente. He has been published in many books and journals on energy and sustainability, and has taught urban planning and urban ecology at the Universities of Rome and Pescara. An architect, he holds a PhD in urban planning, a postgraduate specialisation and a master’s degree in architecture from La Sapienza, University of Rome. He is a member of the board of FREE (Association of Renewable Energy and Efficiency).